Perfect for fans of Philippa Gregory and Alison Weir, The Boleyn Reckoning heralds the triumphant conclusion of Laura Andersen’s enthralling trilogy about the Tudor king who never was: the son of Henry VIII and Anne Boleyn—Henry IX—who, along with his sisters and those he holds most dear, approaches a dangerous crossroads. The Tudor royal family has barely survived a disastrous winter. Now English ships and soldiers prepare for the threat of invasion. But William Tudor—known as Henry IX—has his own personal battles to attend to. He still burns for Minuette, his longtime friend, but she has married William’s trusted advisor, Dominic, in secret—an act of betrayal that puts both their lives in danger. Princess Elizabeth, concerned over her brother’s erratic, vengeful behavior, imperils her own life by assembling a shadow court in an effort to protect England. With war on the horizon, Elizabeth must decide where her duty lies: with her brother or her country. Her choice could forever change the course of history. 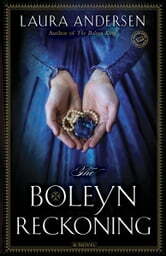 This the final book of the Boleyn Trilogy. It was interesting to read how a King Henry VIII’s son would become king of England. I would recommend to read/know the King Henry and Anne Boleyn history to understand better some of the stories presented on this book. I was half way through this when I began to dislike Minuette but then the author managed to turn it all around and it all made sense, except for Eleanor's final act but except for that, a wonderful trilogy.